A special comic? I'm all for that! 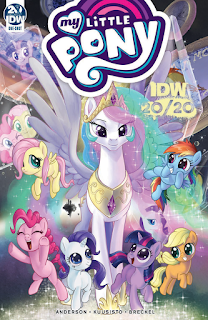 I'm afraid that with the conclusion of Unicron, most of the IDW comics I followed are on a hiatus. 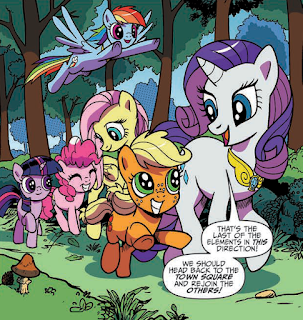 Thank goodness, as always, for My Little Pony. Gonna give props for the uniform and dress designs on the delegation. Actually makes the Elements look like being under-dressed. I think I've been doing artist Toni Kuusisto a disservice by using his "Pencils" fandom name. He's contributed to several comics and shown tremendous skill. It's the same awkwardness I feel when addressing people by their screen names at a convention. It feels like I'm either not treating them as people or not respecting Kuusisto as a professional artist. Plus, it sounds like a bad episode of GI JOE. Friendship is finishing each others sentences. For we are the Borg. Kuusisto has demonstrated great skill in drawing ponies at various angles and expressions. Yet I've remarked in the past that his art has a very fixed style. He doesn't seem to want to play with the characters' models to affect a cartoonish stretch. The end result being that his artwork supports some situations over others. Within the context of this issue, the more comical scenes like the Mane Six arguing with their past selves don't reach their full absurdity. Yet when the scene requires a physical threat it feels more important because these characters are more "solid". You can tell an injury will really hurt. Somewhere, Mr. Beaverton Beaverteeth would be laughing! 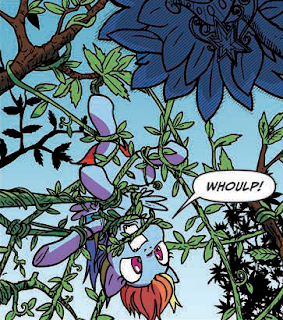 Having reviewed MLP #74 yesterday, I get a fresh appreciation for Kuusisto's backgrounds. He renders each tree, bush, building, and even some blades of grass in detail. I think "solid" is the best way to describe his style. Everything feels present with a strong emphasis on perspective and proportion. 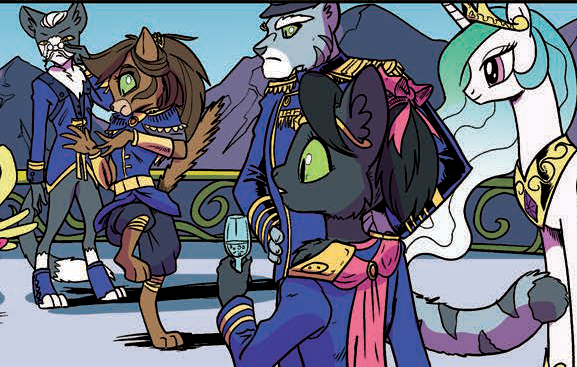 There are some times where this detail might actually undermine the perspective. 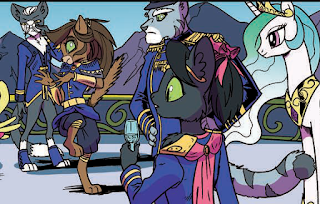 Case in point, a panel where the two Twilights depart Canterlot. happened to look up at that moment? Kuusisto displays the city in detail to the point that I can make out the panes in windows and gaps in rails. One idea behind creating a sense of depth is that the further away something lies, the less details one can make out. It's a judgement call but there are times I wonder if there's almost too much detail to convey a sense of distance. She's got diamonds on the inside! We start off in Canterlot, with Rainbow Dash performing for an Abyssinian delegation while her friends cheer. For reasons I don't understand, Twilight and the others are all wearing their elements of Harmony, complete with the old-school crown thingy. This isn't the first time they've retrieved the Elements from the Tree of Harmony, but each time they do it makes the season 4 premier less special. Giving up the Elements was a big event within the show's history, but it can easily seem like plugging them in for a recharge until the next time. The adorableness has been doubled! 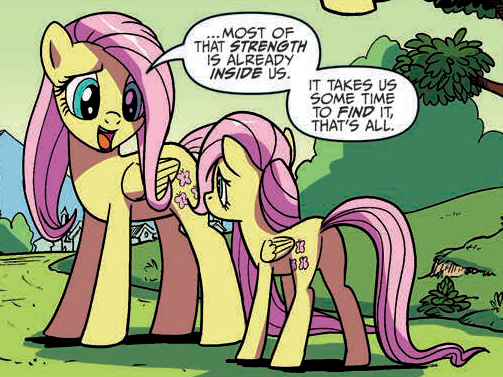 I still think Fluttershy is the poster pony for character growth. Even though I said that Kuusisto tends to draw the ponies more solid than others, he definitely knows how to make them adorable. 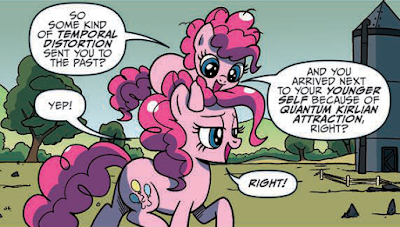 My personal favorites are Pinkie Pie and Rarity interacting with their future selves. A mixture of adorableness and excitement. Pinkie Pie is your source for convenient exposition. In terms of conflict it has less to do with immediate danger. 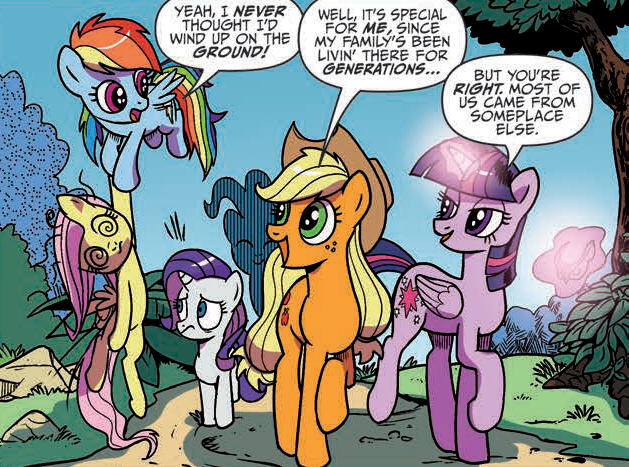 Rather, the adult Mane Six have to encourage their younger counterparts and contrast their worldviews. Young Pinkie can't imagine leaving the rock farm. 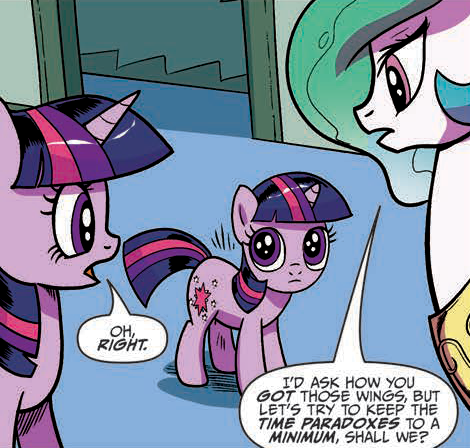 Twilight is still in the phase where friendship is unimportant. Young Fluttershy is even more uncertain than her adult self. They found a way to make her cuter! Once they've established the need to find the Elements, we get a pair of teams split evenly between mares and fillies. We get a contrast in how the foals attempt to do everything on their own or argue while older teammates combine their talents. There is a point where Twilight could likely solve the whole problem with some magic, but I think she holds back so that the younger ponies can take in the lesson. Better to show teamwork for a small problem so you know you can count on others for the big ones. It's also nice to see the Young Six disagree with one another and be unsure of what to do next. They're still figuring themselves out, let alone a group dynamic. It does make me appreciate how they come to mesh as a team. Your family has lived there for three generations, AJ. Don't go trying to over-hype it! At first, I was surprised that none of the Mane Six attempted to change the future. 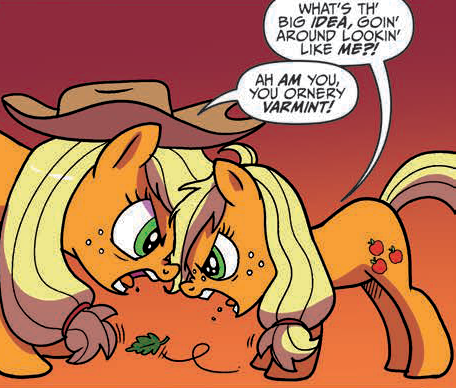 A warning to their younger selves to do this or watch out for the wrong ponies. 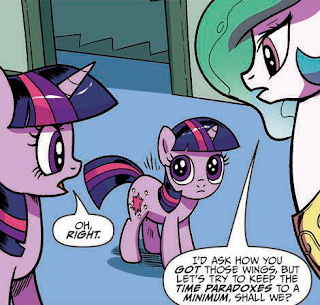 Never trust a pony with Flim or Flam in their name. Goodness knows they've made plenty of mistakes and I imagine anyone in that situation would be tempted to give a warning. Which then led me to ask the purpose of such an action. Sure, you'd avoid a bump in the road but your past self would also spend years waiting for the bump to appear. In fact, you could probably miss out on a lot of life just waiting to avoid one bad event. Some of the best time travel stories I've witnessed have reinforced that while an event can be painful, the growth that results can benefit us. And if you've ever heard of someone living a flawless life, they probably weren't living it to the fullest. This is the most dangerous situation within the story. Might call it de vine intervention! Wouldn't it be much better to just say to your past self, "You're going to be okay"? Maybe that sounds too naive or optimistic. Then there's a better saying featured in several classical stories. One that I think serves as caution but also hope. "This too shall pass." 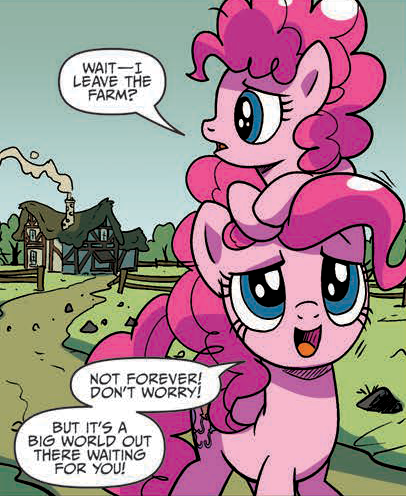 Kinda funny to imagine Pinkie hesitant to leave anywhere. But when that's you're whole world, it's understandable. 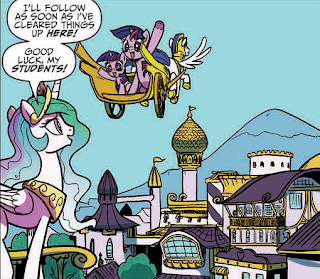 That all leads us to Celestia, who has to work behind the scenes to avoid temporal paradoxes. Though we're never sure if she blocks her own memories. If not, it would explain a few things within the series but also place a heavy demand. 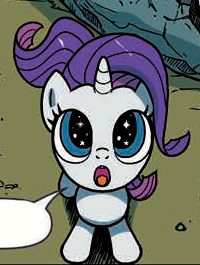 Celestia has been given a glimpse of what's the come. A landmark along the road of time. Yet she hasn't enough information to know the path so, like I said before, she's taking on the burden of knowing an outcome without knowing how to reach it. 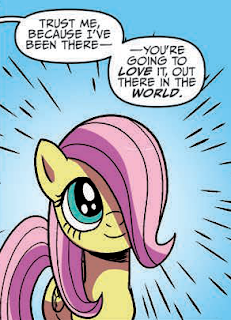 That's a tremendous leap of faith but it would explain how she knows to stay out of the limelight and let the Mane Six build their legend. "I'd also like to ask what happened with Luna? happened to my mentor, Starswirl the Bearded?" 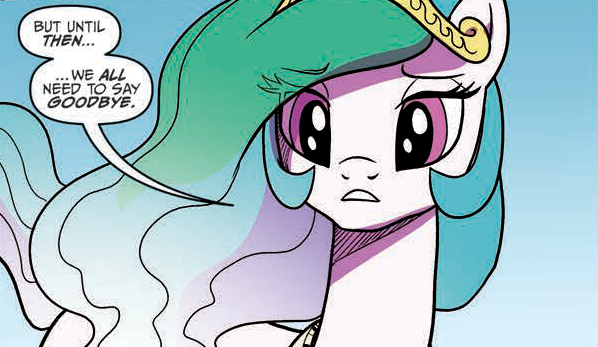 In fact, there's one important aspect to Celestia. 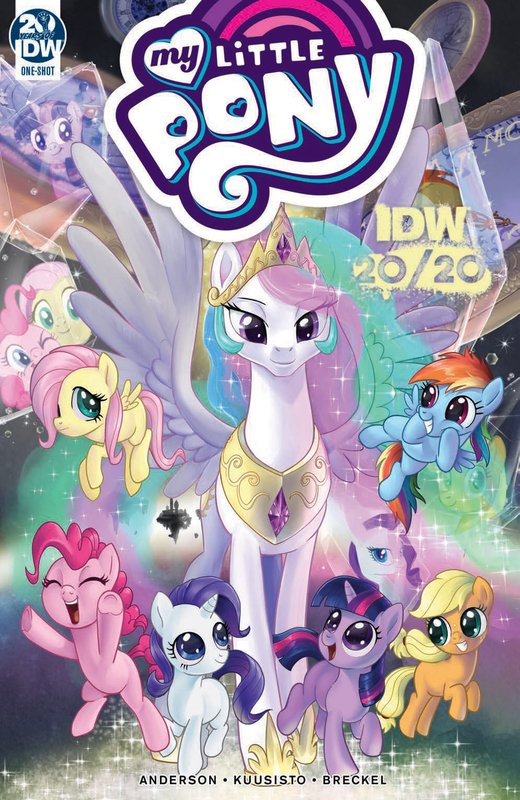 Of all the ponies who might wish to know about the future, she never once asks what has happened to Luna. Given that the Celestia in the past is still awaiting the chance to save her sister, that's gotta be a temptation. That expression really sells that this isn't an easy thing for her. 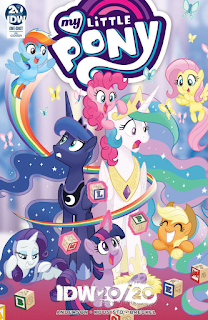 Celestia may be powerful, but she is still trapped within time. By story's end we've had a sweet meeting of two time periods with a lot of optimism. This is a celebration of how these six diverse characters came together to form both a strong team and an enjoyable show that lasted far longer than anyone expected. 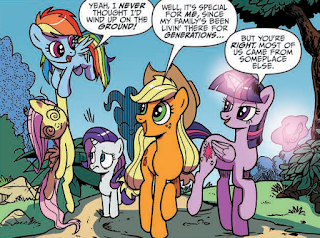 We get to see how the developing Mane Six couldn't mesh at first but their older selves showed that they could grow into an effective team. The conflict never felt super-high stakes, but I don't think this story is asking us to look for such danger. "Does this happen often, your highness?" "How can one define 'often' when it comes to time travel?" It's a fun story, beautifully illustrated, with a question more for the audience than the characters. What would you say to your past self? I think all these are the best message you could tell yourself. Anything less wouldn't inspire hope at all.